This area is also called the “depletion region,” where charged particles “travel in and out of the heliosphere along a smooth magnetic field line instead of bouncing round in all directions as if trapped on local roads.” Twenty-four hours after Voyager arrived, “the magnetic field started to pile up with particles,” in a move that has been compared to a rush hour traffic jam. This close to the edge of the Solar System, scientists have been able to pick up cosmic rays that originated from dying stars for the first time. After completing their initial mission of examining Jupiter and Saturn, the largest planets in our neck of the woods, Voyager 1 and 2 pushed on into space, stopping off at Neptune and Uranus in the latter portion of the 1980s. Despite having 1/100,000 the memory of an iPod Nano, the two craft have continued deeper and deeper into unexplored territory. In order to conserve power, the scientists who control Voyager 1 turned off its cameras after Neptune. At the current rate, the craft could, with more strategic systems shut down along the way, continue to function until 2025. The craft still sends back daily reports, which take roughly 17 hours to reach Earth. 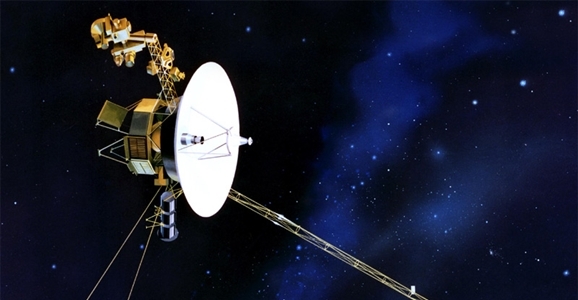 Voyager 2 is also still alive and kicking, though it is a mere 9 billion miles from Earth, well inside the heliosphere. It’s got some catching up to do, despite being launched a few weeks earlier than its companion. Slacker. Carl (Sagan) would be so proud of our little ambassador.